Using the Toobeez, students are going to construct a mountain plot line to represent the story events in The Wizard of Oz. Have Toobeez available for setup. Refer to samples of plot elements to include. Ask students about some recent favorite books they have read and why they liked the stories. Ask students, “What makes a good story?” Steer students toward the topic of plot and that good conflicts make stories interesting. Remind students that stories without conflict do not maintain a reader’s interest. 2. Review these terms with the group before beginning the activity. * The plot is made up of the series of events that take place in a story. * The exposition is the beginning of the story and introduces the setting, main characters and conflict. * The conflict is the problem or obstacle the main character(s) must overcome. * Rising action includes all the events that lead up to the climax. * The climax is the turning point of the story and has the most action. * Falling action includes the events following the climax. * The resolution is when the problem is solved in the story. 3. As a class, students are going to “build” the plot of a well-known story, The Wizard of Oz by L. Frank Baum. You could also use a recent class read-aloud, a picture book or other popular story. 4. Read aloud the following Activity Challenge Box to the group. Challenge: Using the Toobeez, students are going to construct a mountain plot line to represent the story events in The Wizard of Oz. 5. As elements of the story and plot (such as characters, setting, main events and so on) emerge from the conversation, students may take turns writing down parts of the story on pieces of large construction paper. Decisions will need to be made about what is important enough to become part of the plot line. 6. Have students construct the Toobeez mountain plot line. On each section, students should display the construction paper story elements. You can do this as you go or after you have completed reviewing the story. See below for the plot line shape and refer to pictures. 7. *You may adjust the number of main events if needed, but try not to have more than five (for stability of the Toobeez mountain). 8. 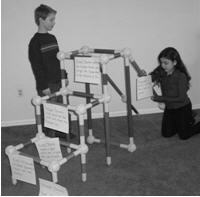 Once assembled, have students review the elements of a plot and discuss how this represents a mountain. What is conflict, and why is conflict a critical element to a good plot? What was challenging about identifying the plot lines of a story as a group? How did constructing the plot line using Toobeez help you to understand the elements of a good plot? How did you show respect to others during this activity? Why is it important to show respect to others, especially when working in a large group? 1. As a writing lesson. When writing a story, students are often quick to begin drafting before they have thoroughly developed a plot. This tends to lead to stories that end in “and then I woke up.” To avoid this problem, use this lesson at the beginning of the year to emphasize the importance of plot so students can develop rewarding plots all year. This lesson can help reinforce the idea of summaries as well. If students turned this visual plot line into a paragraph or two, they would have a good summary of the story. To reinforce this concept during the following days or weeks, have small groups of students read picture books and then the groups can take turns to construct plot lines for the books they have read together. Have students display the title and leave the picture book and its plot line up for a few days for students to review.